Ready to schedule a live demo? We'll contact you as soon as possible to schedule your live demo. Live demos are a great way to learn about SOMAX and for us to learn about your organization's needs. We look forward to meeting you! Maintenance management in food processing facilities brings with it a unique set of challenges. It is not only important to plan, schedule, track and document maintenance activities, but to also do the same for sanitation and cleaning procedures as part of maintenance operations. Additional food safety checks are also required to ensure a safe and compliant maintenance process. While most food processing plants keep a Master Cleaning Schedule, usually not enough is done to track and document proper cleaning of an asset after failure or unplanned maintenance. 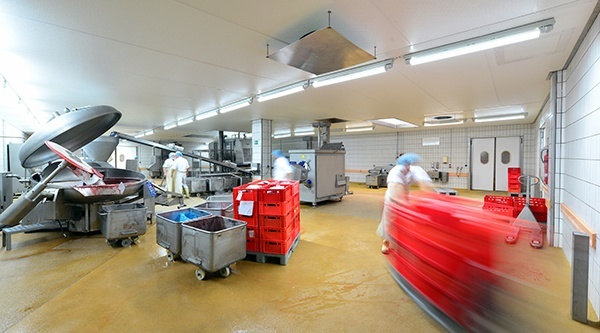 Food processing plants need a CMMS system specifically designed for them; with fully integrated sanitation tracking, food safety checks, and sign-off on all work orders. Another reason to integrate sanitation with maintenance software is that sanitation personnel work directly with your assets on a regular basis during cleaning procedures. Having the ability to identify and report any issues noticed while sanitizing the equipment can significantly reduce preventive maintenance costs. Auditors not only want to see work performed to maintain and repair assets and equipment but also a record of cleaning and sanitizing procedures, as well as sign-off and verification, before returning them to production. This sign-off is a critical step in continuing your facility's audit-ready status and maintaining BRC and SQF compliance. A major challenge that food processing facilities face is the time it takes to document maintenance and cleaning activities. The outdated method of printing paper work orders, then manually completing and entering them into a CMMS is ineffective and time-consuming. Maintenance personnel are among the highest skilled and highest cost employees in most plants. Sitting at a computer filling out paperwork is certainly not the best way to use their valuable time. To address this issue, it is important to introduce mobility into food processing maintenance. Your CMMS should include the ability to use mobile devices and native apps for key tasks such as creating work requests and work orders, completing work orders, and checking out parts using built in hardware like barcode scanners and QR code readers. Production schedule changes are a fact of life in a food processing facility. By using mobile apps that always have the latest available information, maintenance and sanitation personnel have access to their work schedule and are notified throughout the day as scheduled work changes or unscheduled work is added. By integrating sanitation into your maintenance system, and using mobile devices to reduce paperwork and create real-time interaction with your CMMS, you can increase communication between your maintenance and sanitation departments, reduce asset issues, and create a system that ensures your facility is audit-ready at all times. Know some best practices to successfully create an audit ready facility using CMMS and sanitation together? Let us know by leaving a comment below! We write our blog to provide information and knowledge in maintenance management and CMMS for people in all industries. If you manage maintenance, we're driven to provide interesting articles and information for you. Show you why we love what we do. ©2017 SOMAX, Inc. All rights reserved | SOMAX and the SOMAX logo are the trademarks of SOMAX Inc.